The big picture opens with an icicle-sparkling trolling camera sequence of lush red warm Santa's village, elves busy at work on the toys, dancing and happy, praising Santa, "I love you more than my own head," "I love you more than track lighting." This sequence brings back memories of childhood holiday specials then enlarges them into a 3D world that you could almost step into. And the fresh silly humor brings yet another rich dimension to the experience. Then we're introduced to the lonely snowman who has no friends and therefore can't even speak. He just plays his flute, until, oops, he drops it and decides to replace it with one from the nearby elf toy factory. This immediately prompts a breach in Santa security and initiates a winter wonderland war at times (intentionally) mocking the likes of "Star Wars." Well, I don't know about you (so write in and tell me), but I don't like my holiday specials to look like my everyday meat and potato films. If this picture had made a conscious decision to be irreverent, in the manner of "South Park," then that's one thing; but, instead, "Santa vs. the Snowman" seems to be a family friendly traditional holiday special that dabbles in the irreverent. On a completely subjective level, frankly, I don't think that works very well. Christmas films should be Christmassy - not "Star Warsy." And especially in these political times, do we really want to be reminded of anything military? That said, and despite lacking any truly breath-taking 3-D imagery, the film still looks good and has a good sense of humor. Snowman disguises himself using only a set of Groucho Marx nose/glasses and enjoys a tour of SantaLand guided by the drably comical voice of Ben Stein. This is a very funny sequence. While you might be turned off by the mistletoe missiles, you'll probably appreciate the ultimate resolution message: "Love your Enemies." You've just got to ask yourself one question, "Am I okay with Santa as Commander in Chief?" Related article: "Santa Clause 2." 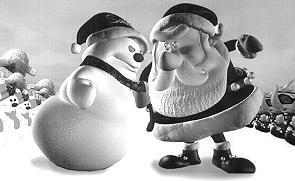 Santa vs. the Snowman 3D. Copyright © 2002. Voiced by Jonathan Winters (as Santa), Ben Stein, Victoria Jackson. Screenplay by John A. Davis. Produced by John A. Davis, Keith Alcorn, Paul Marshal.